Highly expensive wines: prestige, brand, name, history, quality, small production...still worth it or not? still as attractive? still selling? As you may have realized by reading most posts on my wine blog, I like to write about lesser known appellations, unusual grape varieties and obscure wine regions. My job as a Wine Buyer and Sommelier, since I started roughly 17 years ago, has always been to find and buy (and share) these little wine gems scattered through out the whole world and to open the mind and more especially the palate of my customers. Of course, a lot of amateurs, connoisseurs, collectors, Wine Buyers and Sommeliers only swear by the brands or labels and the most well-known producers and winemakers around, but as the grandson of a local winemaker myself, I've always preferred to support the smaller, more artisanal, winemakers. Don't me wrong, I also appreciate the established and expensive brands and labels too, for their quality, their prestige and their history, but I very often have little interest to buy them for the store due to limited sales and obviously can not really afford them for myself. In most cases, I even find them way too overpriced and overrated. Moreover, for the past 3-4 years, they have become sleeping beauties with very slow turn-over, and although they are still selling from time to time, they do not trigger the same interest as they used to. People don't want to pay the high price for these wines no more, even despite their prestige and what they represent. And don't get me wrong (again), but even prestigious wine names have bad vintages. I experienced it many times. Whether complementing a lunch or a dinner with family and friends or in a restaurant as a Sommelier or as a customer, at the property itself with the winemaker or during tastings, not all of these wines were great or unforgettable, some were really bad or didn't age well, and in most cases their quality didn't necessarily justify the asking price. Due to a degrading world economy, more overwhelming and omnipresent advertisings from cheaper and lesser quality brands and the ever increasing amount of wines available in the market, the era of highly expensive wines is, in my opinion, finished after nearly 70 years of reign. It is quite unfortunate, because, in the last 17 years, I had the privilege to buy, open and taste (and share) many vintages (old and new) of thousands of these exclusive bottles from all around the world: during the "En Primeur" Bordeaux campaign nearly each year, but also in many wine trips all around France, Spain, Chile, Argentina, California (and a few more places else where), during tastings and wine dinners when I was a Sommelier (and Wine Buyer) in Bordeaux, Paris and London. Furthermore, since I arrived in New York, about seven years ago, I had the chance to taste many more of them, due to my position as a Wine Buyer for retail and wine boutique, which even brought me more occasions to taste these prestigious wines, less old vintages but nevertheless still from extraordinary names and regions. As I said: "the era of highly expensive wines is, in my opinion, finished after nearly 70 years of reign." And here is my version of how they became established names and brands and how the end of their era did happen. First, you have to remember that most of these well known names, brands and labels established their fame through out the last 30-40 years only, 60-70 years for the oldest. Before that, the few well known ones were the jewels of the table of rich and notorious personages. Luxury products estimated by the connoisseurs and the collectors and barely accessible for the general public. Let me explain, (also read my previous post on the subject at www.ledomduvin.com or click on the following link: "Biodynamic, Organic, Sustainable Culture, Lutte Raisonnée, etc...."). Remember that although wine (and its variants) has always been a part of the culture and the history of man (and woman), since the Neolithic period (appearing somewhere between 8,500 and 4,000 B.C) up until about 500 years ago, wine (made from domesticated and tended Vitis Vinifera grape varieties as we know it now) was mainly and principally produced in the countries surrounding the Mediterranean sea from Lebanon to Morocco, then rapidly expanded and even better adapted to the western and northern Europe (then the rest of the world) where it is now one of the most lucrative agricultural products. At this time, only a few hundreds wineries (at the most) constituted "la crème de la crème" of wine. We had to wait for monks then travelers and settlers, who brought the gapes and methods to the newly discovered continents and countries between the 15th and the 19th century, to see wineries mushrooming around the world and thus much more competition and choices in style (like North and South America, South Africa, Australia, New Zealand, and more recently Asia). And as I said earlier in this post, up until the late 19th century, wine (especially for the more established names and labels) was still a luxury product reserved for the elite, the richest and the most fortunate. Even most producers of that time didn't enjoy much of it. The lands and the vineyards often belonged to aristocratic and "bourgeois" families, and the produced wines were sold mostly in bulk to rich négociants and other merchants to be bottled, marketed and sold. Even during this time, brands and labels were promoted by the vendors and established by the high society, not necessarily by the Châteaux or the estate owners, although they benefited of it. The beginning of the 20th century marked a revolution and a renaissance for wine production and its consumption, especially after the devastating Phylloxera plague which destroyed roughly 3/4 of most European vineyards, the first World War and the different prohibition movements around the world between 1900 and 1935, which slowed down the market and the sales, and changed the public opinion towards alcohol production and consumption in general, including wine. 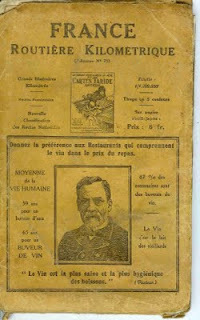 By the mid 30's, in France and a few other countries in Europe and despite the difficulty and the consequence of it, wine was being promoted as a healthy product (which it is, in moderation of course) to increase the sales and encourage people to buy and drink more, which was a bit difficult but needed during these modern dark ages with the subjacent and up-on-coming second World War. "Wine is the most healthiest and hygienic drinks"
"Give the preference to restaurants that include wine in the price of the meal." "Human Life Average: 59 years for a water drinker against 65 years for a wine drinker"
"87 % of the centenarian are wine drinkers." "Wine is the milk of the elder." What a great advertising, isn't it? I love it! I know, I know, some people will be offended... well, sorry, but I still love it. Let's get back to our subject of the day. By 1940, except a few exceptions amongst the most recognized and established names and labels which succeed by getting even more attention, more than 80% of the wine production in the world consisted of low quality, chaptelized, often sour, bitter and tannic, even sometimes sweet or fortified wines. Basically, the wine production suddenly and drastically increased after the second World War, in the 50's and more especially the 60's. The world population nearly double in 30 years after the 40's (also read my post on Biodynamic, Organic, Sustainable Culture, Lutte Raisonnée, etc...."). New techniques were applied and many more wineries mushroomed as well as new talented winemakers arisen. But due to over-planting and over-production, quality was still a bit of an issue for most producers everywhere, and only a small bunch of them came out of the lot as classics and benchmarks in their own appellations. Nearly 20 years passed and the "Baby Boom" generation, born just after the 2nd World War and now in age to be drinking, was ready to take over the world in everyway possible and was more educated and attentive to their drinks, especially their wines, than the previous generations. New techniques, researches and studies brought more accurate knowledge and information about the soil, climate, microclimate, topography, geology, importance of drainage and exposure to the sun, leading to a new era of wine making and vineyard management. Bringing new ideas and new tastes to the wine world, as well as accelerating and increasing the wine production due to constent, increasing demand. During the late 60's and begining of the 70's, when bottling at the estate began to be a less expensive and more common practice for Chateaux owners and other producers, and especially since the label saying "bottled at the Chateau" or "bottled at the property" was firmly established as a sign of quality and provenance of the grapes and the wine itself, the fame of some of the most established brands of today's market became even greater and quality somewhat risen. By the mid 80's and beginning of the 90's, with the rise of the rapidly-growing-in-popularity-and-influential wine critics, like Robert Parker Jr., in order to consolidate and maintain their heights compared to others and satisfy the ever increasing demand, established names with prestige, history and quality had to produce and promote more. Evolving as quickly as the marketing methods to keep their undeniable advanced on the new talents and somewhat more innovative and better marketed new comers from all around the world. Also in the 80's and 90's, after further studies and researches, producers and winemakers attached a bit more importance to the different types of soil and micro-climate, and Terroir in general, and began to uproot old inefficient parcels to replant better adapted grape varieties in accordance with the different types of soil, consequently increasing quality and producing greater and healthier wines. Therefore, gradually from the late 80's to roughly 2006, partly due to their quality, history and prestige, and partially due to the ever increasing demand and interest from emerging wine interested countries (like Russia, China, Japan, Corea, Brazil, some of the United Arab Emirates, etc...) but, in my opinion, mostly by greed, prices attained never-reached-before-ceilings. Skyrocketing even further more to outrageously expensive prices between 2000 and 2006, with vintages like 2000, 2003 and 2005. For example a 2000 vintage Bordeaux 1st growth like Château Margaux or Château Latour was sold at an astonishing $125-150 a bottle en Primeur in 2001 (and much more when it arrived in the market in 2002), against $550-575 for a 2005 vintage of the same 1st growth Château (and way much more when it arrived in the market in 2007), which is roughly a increase of 500% in 5 years and Bordeaux wasn't the only region to unjustifiably increase their prices. Many other regions readjusted their prices to higher grounds to match, compete and reach the same level of popularity, some without any apparent reasons and some for sudden increase in popularity but not necessarily in quality. However, and in my opinion, since roughly 2006, I 've seen a shift in the market and the interest of the customers going from highly expensive brands, labels and names to more interesting wines made from unusual grape varieties crafted in lesser known and somewhat obscure regions at less expensive thus more attractive prices and delivering as much or sometime even more complexity and layers of aromas, flavors, texture, structure, balance and depth, than much more expensive wines . Moreover, for the past nearly two years, people have been restricting their weekly wine budget in New York and everywhere else (or monthly or yearly as you prefer, you got the picture). They do not want to spend their money the same way, compromising and making wiser choices. In my opinion, this crisis started 3 or 4 years ago and has gradually infested everyone of us. Customers that used to spend $75-$100 and more a bottle, are now spending between $30-$50 (at the max); those that used to spend $40-$75, now only buy between $20-$35; the ones between $18-$25 are now between $12-$20 (at the max)...and all the $15 and under, are now trying to spend less than $10. In fact, since September 11th 2001, after the destruction of the World Trade Center (which is by the way not rebuilt yet, 8 years later.....no comment...), then the gradual collapse of Wall street, the real estate market, the banks, the insurance companies, and the consequently degrading world economy, lack of opportunities and jobs, and the ever increasing number of unemployed people, customers and consumers have been more and more careful about how they spend their money. Whether on the wine list of a reputed restaurant down town or on the shelves of their favorite local wine boutique, patrons have been hesitating on buying and ordering the most exclusive wines, leaving aside the highly priced names, labels and brands that have been the proud leaders of their own appellation for decades to choose lesser known yet as interesting and enjoyable wines for a price more appropriate to their wallet. Not by lack of faith or taste, but because they don't want to spend the kind of money these wines demand. Moreover, people are more and more educated about provenance, quality, taste and especially pricing due to a blooming and very lucrative wine education market with multiple classes and tastings, and an explosion of wine magazines, wine websites and wine blogs (like mine) on the internet. People know how to diversify the source of their information, and nowadays, more than ever, form their own opinion rather than listening blindly to the critics. The reign of the names, labels and brands is slowly fading away, especially due to their prices, to leave its place to a new era of wine discoveries for a younger public in quest of better quality wines for lesser prices. That is why I'm asking openly these questions to whoever wants to answer them: "Highly expensive wines: prestige, brand, name, history, quality, small production...still worth it or not? still as attractive? still selling?" Still worth it? Probably for some of the rare and immensely rich amateurs and collectors who can afford it but surely not for the rest of us (most of us should I say) that will never be able to afford it or never be willing to pay these outrageous prices. Still as attractive? Well, not really either, because I find fantastic values nearly every week, which I found much more attractive and often delivering as much or sometime even more complexity and layers of aromas, flavors, texture, structure, balance and depth, than much more expensive wines. Still selling? Unfortunately not anymore and definitely not as much as they used to just only 3-4 years ago. For the past 5-10 years, these names, labels and brands have become more acquainted with cargo plane, shipping boat and truck to go from one place to another, like auction company to collectors to auctioneers again to private cellars to retail or special distributors, through out the world, but they rarely get opened. It is a shame, somehow, that these prestigious bottles have lost, over the years, the respect of such loyal consumers because of greed and unbelievable prices. No offense but it is true! Some of you may not understand what I mean by names, labels and brands, so here is a list of some of these wines that I bought, tasted, drunk, shared and enjoyed over the past 20 years as a wine amateur and 17 years as a Wine Buyer and Sommelier. It is also for you to better understand that I do have nothing against these wines that I had an immense pleasure to open and drink, however they are now back to their old place as luxury products only available and accessible to very few of us. I hope that you will comprehend my way of thinking behind this long post and take no offense of it, especially the owners and winemakers of the following wines. Welcome back to one of my summer places of choice for light, vibrant and refreshing whites, rosés and reds: Loire Valley. Often called the "Garden of France", Loire Valley is an enchanted land covered by vineyards, flowers and gently rolling green hills dotted with more than a thousand Châteaux, on both side of the Loire River. All along the river, sumptuous Châteaux and "Maison(s) Bourgeoise(s)" surrounded by maze of amazing French and English gardens, flower parterres, vineyards and quaint, scattered little villages, share the 1000 kms (629 miles) of the Loire River banks. France's longest river serpents and extends from its source located near the Mont Gerbier de Jonc (a mountain located in the "Massif Central" in France, rising to an altitude of 1,551 m -5,088 ft-, and giving birth - at its base- to three springs that are the source of the Loire River), passing through the towns of Roanne, Orleans, Blois, Tours, Saumur, Angers and Nantes to where it ends and reaches the Atlantic ocean in the Bay of Biscay at St. Nazaire. After a few days visiting the Loire Valley and its treasures, you will realize that it is probably the charm and the beauty of its gentle, paced life and landscape that have, for centuries, made the Loire Valley a sought-after location and destination for kings, land lords, musicians, poets, writers and other artists, and nowadays tourists. People in quest for quietude are at peace in this incredible environment where nature and architecture intermingle and reside magnificently. It is a step back through the history of some of France's finest works of art and architecture. Cheverny and Cour-Cheverny are two small communes, close to each other and often shorten by "Cheverny" only, nestled in the Loir-et-Cher departement (county) in central France, renown for their wines and the famous Château de Cheverny. FYI: If your are keen amateurs of architecture, Cheverny is surrounded by some of the most beautiful Châteaux of the Loire, i.e. : Cheverny, Blois, Chambord, Troussay and many more. Cheverny produces refreshing whites usually made with Chardonnay and Chenin Blanc, but also some light, earthy reds are made from Cabernet Franc, Gamay and Pinot Noir, while Pineau d'Aunis and Grolleau are allowed for the small quantities of rosé wine produced. Cour-Cheverny village lies in the Loire valley, north-east of Tours and about 12 km (7.4 miles) southeast of Blois and about 1.3 km (0.8 miles) north of Cheverny, on the road to the village of Romorantin-Lanthenay, where the Romorantin grape supposedly took its name from. Romorantin is a French traditional white grape variety, which, after results of DNA researches appeared to be a cross between "Gouais Blanc" and "Pinot fin teinturier" grapes, making it a sibling of Chardonnay and Aligoté. Legend has it that Romorantin was introduced to the Loire Valley by French King François 1er, an important figure of France and Loire more especially in the early 16th century. Once quite widely grown in the Loire Valley, Romorantin is now mainly planted and produced in the Cour-Cheverny AOC. It produces intense, bright yet well rounded, mineral wines somewhat reminiscent of Chablis by the acidity, Meursault for the complexity and richness, and Vouvray for the rounded, waxy coating palate. Domaine de Montcy is an estate of 20 hectares, located in a "Lieu dit" ("a place known as" in English) called "Voie de la Porte Dorée" (or "Porte Dorée"), about 4 kms to the southwest on the out skirt of Cheverny. (A "Voie" refers to an ancient road, usually small, that could even be only dirt, and represents the old path traced by our ancestors over the centuries). Domaine de Montcy is now owned by Laura Semeria, born in Italy, who followed the steps of her French husband Léonard across France to finally stop near the Loire River. Dreaming to buy a wine estate and after months of searching in vain in Italy, it is, after all, the small appellation of Cheverny that opened its arms to her. She found an estate for sale with a very welcoming owner and a promessing vineyard, and decided to buy it. This new acquisition allowed her to settle down in Cheverny, near the Château de Troussay of which the Domaine de Montcy now manages the old vines and the ancient vineyards of the Château. Since 2005, Domaine de Montcy's vineyards management is under "agriculture raisonnée" (or sustainable culture, with an organic approach), a system of durable agriculture concerned and respectful of its environment (soils, vines, plants, herbs, insects, etc..), to produce better and more natural wines from carefully attended vines resulting in higher quality grapes. The cellar is also equipped with state of the art vinification tools allowing minimal intervention to craft more authentic wines. The only objective of the Domaine is that the 120.000 bottles sold each year offer and reveal the best of their Terroir, grape variety and climate of origin. Domaine de Montcy produces some excellent Cheverny wines in red, white and rosé, as well as a great "Sauvignon Blanc VdP du Jardin de la France" and interesting sparkling "Crémant de Loire - Méthode Traditionnelle", but our interest for this post turns to their Cour-Cheverny. Carefully crafted with 100% Romorantin grapes exhibiting a typical expression of the clay-siliceous Terroir of origin, the racy and rich in aromas "Domaine de Montcy Cour-Cheverny" is produced in tiny quantities, thus it is very appreciated and sought after by both the amateurs and connoisseurs. De Montcy makes two wines from this little appellation: Cour-Cheverny (today's wine) and a higher cuvée from older vines and selected parcels, Cour-Cheverny Cuvée "Claude De France". 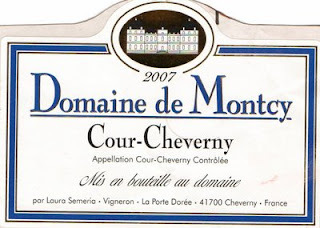 Issued from their best vineyards in Cheverny, and more especially Cour-Cheverny (for today's post), Domaine de Montcy also applies a rigorous parcel selections of their Romorantin's vineyards and hand harvest with successive sortings to pick the grapes at ideal fruit ripeness and phenolic maturity. Under "culture raisonnée" (or sustainable culture), the vinification and ageing processes are natural and particularly adapted to each batch of grapes, with indigenous yeast and no use of any industrial yeasts or enzymes. Hygiene conditions are maximal in the cellar, which allow for minimum use of SO2 (Sulfur Dioxide) and fuller flavor expressions. After a good half an hour in the fridge, to cool it to the right temperature, not too cold, a little decanting should help to exhibit the fullness and richness of this wine. Info partly taken from the winery website at www.domaine-de-montcy.com, translated from the French, because the English version is still under construction. Small appellations are too often neglected and forgotten, although it is probably in some of those hard to pinpoint, minuscule wine realms that some of the best wines are produced by unrecognized artisanal winemakers that really work hard to craft and achieve their best juices. Côte Roannaise is one of these up-and-coming yet fairly unknown appellation. The appellation is located in the upper Loire, slight northwest of the city of Lyon, and surrounds the village of Roanne. Côte Roannaise produces predominately light reds and some rosés, both made from the locally adapted Gamay grape (also called Gamay à Jus Blanc) and a touch of Pinot Noir (depending on the producer and the vineyard); which explains their style being quite similar to those from the neighboring Beaujolais (both in the Rhône-Alpe region). There are a few "Domaine de la Perrière" and "Clos de la Perrière" in France and especially in the Loire Valley (and at least one in Burgundy). Probably three of the most well-known are the Domaine de la Perrière in Sancerre and the one in Chinon, and for Burgundy, the one in Fixin. However, this post is about Philippe Peulet's "Domaine de la Perrière" crafting excellent, Terroir driven wines in the Côte Roannaise AOC, an isolated appellation in the extreme south-eastern part of the Loire Valley, located near and roughly at the same level as the south of the Côte Chalonnaise and Beaujolais. Philippe Peulet's Domaine de la Perrière is nestled in Ambierle, a small little village located northwest of Roanne at the foothills of the massif of the "Monts de la Madeleine", a few kilometers east of Vichy (north-west of Lyon). The vineyards, mostly old vines Gamay and a bit of Pinot Noir, are planted on granite soil on the eastern flank and foothills of the "Monts de la Madeleine". Their south-eastern exposure and the rocky soil are ideal conditions for this two cooler-climate-appropriate grapes. More over, the old vines confer undeniable complexity, richness and earthiness, resulting in earthy, smoky, intense features in the palate. Whether producing wines under the "Côte Roannaise" AOC or the "Vin de Pays d'Urfé" appellation, Domaine de la Perrière practices vineyard management and cellar vinification with an Organic approach: no herbicides; no insecticides; restructuring of the soils by constant and continuous adapted seasonal work of the ground with aeration and natural composts; no use of industrial or genetically modified yeast, only indigenous; also vinification and ageing occurre in used "Fût" (oak cask) to maximize the wine's fruit profile, character, structure and volume, and thus avoid the masking heavy oak, toasted characteristics and woody flavors of brand new barrels. All the good ingredients and techniques to make great wines. 2006 Domaine de la Perriere Cuvée "Les Bonichons" Vieilles Vignes, lot of mineral expressions on the the nose and palate, floral notes and fresh, juicy red and dark berries (mûre and myrtille - black and blueberry in English) flavors mixed with hints of spice. 2005 Domaine de la Perriere Cuvée "Les Moines Noirs" very old vines (100 years old), long maceration for maximum flavor and component extraction followed by ageing in barrels, made with grapes from an exceptional Terroir. Terefore, due to the ripness of the 2005 vintage, the age of the vines and the quality of the Terroir, the resulting wine is a keeper that will please the real amateurs and curious connoisseurs. Decanting is advised, about an hour before drinking or, as I often say, "open it while you're preparing the lunch or dinner, it will surely be ready by the time you finish cooking!" Distributed by Moonlight Wine Co. Bright, light to medium intensity, clean yet slightly cloudy red ruby color in the glass. The nose, restraint at first, developed, after a few minutes, earthy, wet stone minerality mixed with, slightly green-unripe red cherry aromas. The palate offers earthy flavors of unripe red cherry and raspberry complemented with discreet hints of smoky, earthy mature tabaco leaf and a light touch of spice. The palate also exhibits a pronounced yet needed and delectable acidity, delivering almost like a citrus sourness in the mid-palate but in a good way. Kind of weird for a red wine yet it keeps this wine in line and focus, and give it a refreshing attitude (especially after a few minutes in the fridge to cool it down). Very fresh, light, quite juicy with racy red berry profile, ending in a good dry, (somewhat Cabernet Franc-like), slightly tannic yet fruity finish (and I do not mean sweet..I'll shoud write a post about this). 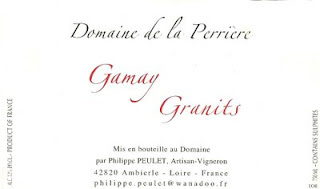 Overall, cleansing, interesting, expanding and intriguing in a good way, this a great Gamay for the summer. Have it slightly chilled to enhance the fruit and the freshness, as an aperitif with cold cut or semi-soft cheeses, or, even better, serve it with a nice "Fricassée de Volaille" red wine sauce (chicken or other poultry casserole, usually cooked with a full Chicken, some smoked bacon, some red from the Côte Roannaise why not?, a lot of garlic, a spoon of tomato paste, B0uquet Garni of Parsley-Stalks-Thyme-Bay Leaf, Salt and Pepper, garnished with leeks and small new potatoes). Is it dinner yet? Lazio, also known as Latium in Latin, was the cradle of Rome and the Roman Empire. The ancient local dialect spoken in this area became the basis for the Latin language. Lazio is a large area located south of Rome that consisted originally of the coastal plain from the mouth of the Tiber river to the Circeian promontory (better known as Monte Circeo, located on the coast about 100km south of Rome), and its adjacent foothills, facing the Tyrrhenian Sea and more specifically the Gulf of Gaeta, south-central-western part of Italy. The main activities and population of the area resides around Rome, the rest of the region (to the south) consists of plains and hills with a few mountains creating beautiful landscapes and ideal condition for grape growing and other crops. The Vatican and the town of Rome, Italy's capital, play an important political, economical and social role in the region. In the heart of Italy and along the Tyrrhenian Sea, and being so close from Rome, Frascati's wines were already known and enjoyed by the Consuls, Senators, Emperors, Bishops and other privileged inhabitants of the ancient Rome. As of today, Frascati's wines still benefit a great recognition from the tourists and other visitors due to their location. Lazio is the center of the Italian political life with the presence of the government and Parliament, and the Vatican represents the Catholic world center. Rome and the region of Lazio are also part of Italy's favorite destinations for the innumerable monuments, ruins and remains, of the Roman civilization and, along the northern Tuscan border, of the Etruscan civilization. Frascati DOC is a small yet worldly renowned appellation located southeast of Rome and roughly starting near the southeastern suburb area surrounding the Roman capital. The town of Frascati is located on the hills surrounding Rome, only a few kilometers south of the Capital, following the Via Tuscolana. Although red production exists in Lazio, Frascati DOC only produces whites, still and sparkling, made principally from Trebbiano and Malvaisia and their many forms (at least 50% and up of the blend). Trebbiano, also known as Uny Blanc in France, is one the most common white variety in Italy, grown almost everywhere but particularly better adapted in the central regions. It has several sub-varieties, or clones, of which Trebbiano Toscano is probably the most planted; other clones include Trebbiano di Romagna, Trebbiano d'Abruzzo (which might actually be Bombino Bianco), Trebbiano Giallo, Trebbiano di Soave, and the relatively fine Procanico. In one form or another, it's the backbone of several classic Italian white wines, such as Frascati, when blended with Malvasia. Malvasia, a popular Mediterranean white grape, also has its many sub-varieties, or clones, like Mavasia (Bianca di Candia), Malvasia (Greca), Malvasia del Lazio (Puntinata). All Malvaisia can be blended with Trebbiano, the choice depends on the producer and the desired style he wants to achieve in his wine. Other grape varieties can also be part of the blend, from 10% to 40% maximum of the blend, here again depending on the producer's style and decision: Greco, Trebiano Giallo, Bellone and Bombino Bianco, and a few more obscure local grape varieties. Azienda Agricolla L'Olivella was founded in 1986 thanks to the intuition of Umberto Notarnicola, an expert winegrower from Apulia, and Bruno Violo, a determined oenologist from Piedmont, both in love with the Latium region. Thus, compared to other long established wineries in this region, L'olivella seems to be a young and dynamic wine estate and farm, yet it demonstrates strong ties with the local culture and tradition, while combining them with newer innovative techniques. Since 2003, L'Olivella has followed organic regulations both in the 12 hectares of vineyards and in the 30 hectares of olive groves. L'Olivella produces 3 whites ("Tre Grome" Bianco IGT Lazio, "Racemo" Frascati Superiore, "Bombino" Bianco IGT Lazio), as well as 3 reds IGT Lazio ("Racemo" Rosso, "Quaranta/Sessanta" Rosso, "Cesanese" Rosso), a sweet wine Passito ("Racimo") and some Olive Oil. L'Olivella "Racemo" Frascati Superiore is a blend of 50 % Malvasia Puntinata del Lazio, 20% Malvasia di Candia, 10% Bellone, 10% Trebbiano Giallo and 10% Trebbiano Toscano. The grapes are from vineyards planted on volcanic soil, with great south exposure, rich in Potassium, phosphor, calcium and magnesium, conferring great complexity, balance and minerality to the wine. After harvest the grapes underwent a Criomaceration (after destemming, whole grapes are cold-macerated for a short period of time, 10-12 hours), performed to concentrate and enhanced the primary flavors of the grape varieties. The wine must was then fermented in small stainless steel tanks to preserve freshness and aromas, and insure a better control and quality of the final product. The 2007 L'Olivella Racemo Frascati Superiore is a great summer white. It has a light, super clear, pale yellow color. Fresh and floral on the nose, it expresses aromas of white flowers, white fruit, citrus peel and a slight nutty touch of fresh almond. The attack is light, refreshing and expands nicely into a somewhat restraint yet juicy mid-palate with flavors of white peach and fresh almond mixed with zesty acidity, which keeps the wine in focus. A bit short in the finish, I need to admit, and its restraint attitude could have used a bit more fruit flesh (body and volume). Overall, it think that it is a great sipping wine, a bit light may be, but I still like it. Fresh, cleansing, mineral, zesty, fragrant and nutty, do not think too much about it, just enjoy it. Picture yourself drinking a glass of this Frascati by a beautiful warm summer day, during a picnic, or a late afternoon aperitif with friends, or even better, admiring the view from on a terrace or balcony at the winery overlooking the vineyards and the city of Rome from the hills of Frascati.... suddenly that wine tastes even better... isn't it? More and more people are intrigued and interested by naturally crafted wines (and other agricultural products), and very often, customers come into the store and ask me: "Do you have any Biodynamic, or Organic wines, or any wine from sustainable culture?" And the answer is: "Yes, of course, but not all wines mention it on the label or are fully certified, so let me guide you through our selection of small artisan winemakers and let me give you my theory about the subject." In some ways Biodynamic, Organic and Sustainable culture refer to roughly the same thing with slight differences and nuances, but as my grand-father will say, we only gave a new name to something that we've been doing since the beginning of time: farming. To better understand why and how our society needed to rename or re-categorize or revamp farming process, we need to go back in time, roughly 70 years ago, when men firmly began to manipulate and try (via the following bias method) to improve the natural farming (agricultural) process and transform the aspect of mother nature, by using heavy manufactured chemicals instead of using the natural ingredients, tools, animals, insects, herbs, plants and soil components used by our ancestors for centuries before. Chemical substance is a somewhat concept that appeared in the late 18th century using and mixing different reactive elements and compounds to modify or enhance or transform some part the composition of a substance or matter. It was slowly developed in the 19th century, and was, because of years of researches, studies and technological progress, mainly used in the early 20th century up until now. Remember that the Phylloxera plague that occurred between roughly mid 1860 and 1920, spreading and devastating most wine regions in Europe, especially in France, destroyed between two-thirds (or nine-tenths) of all European vineyards. A solution needed to be found and chemicals and uprooting vineyards to replant more resistant American rootstocks seemed to be the best against the nearly unstoppable Aphid insect (I said nearly unstoppable, because Phylloxera still exists to this day and it is still difficult to eradicate once it is established in the vines and the ground). So basically, we really started to damage and gradually destroy the natural balance and components of the soils pretty much everywhere in the world since we began to used heavy chemicals and other toxic substances (fertilizers, herbicides, insecticides, synthetic nutrients, copper based mixture, iron based mixture, mercury based mixture, etc...) in vineyards and other types of crop, in the 30's and more especially in late 40's (roughly just after World War II) with the apparition of intense, industrial agriculture and viticulture. Therefore, and accordingly, due to the "Baby Boom" generation, the demand for wines and other crops around the world increased dramatically and took enormous proportions. Thus, governments expanded the agricultural lands and producers planted more vines (sometime planting certain types of grape in unadapted types of soil due to lack of knowledge and soil study) and consequently produced much more wines (and other crops) without necessarily caring about the quality and maximizing the quantity. As long as the wines (and other crops) sold, the rest didn't really matter. People needed to be fed, dressed, housed, etc... so most industries were booming, new ideas were blooming and wineries were mushrooming all around the world. Remember that, at this point in the 50's up until the mid 70's, most European producers didn't bottled their own wines at the property, and most wines were sold in bulk to Négociants, wine merchants or to local co-operatives which bottled, marketed and sold the wines for them (making a lucrative business out of high margins on blended wines with often unidentifiable of origin - i.e. : Shiraz from the Rhone to pump up some Burgundy wines; Spanish Tempranillo and Garnacha in various European appellations; or even riper grapes grown in Algeria to add fruit, dimension and volume, etc... -). You may also not know it, but by the mid-70's, most of today's well known and established appellations and wine regions were doing very poorly (Tuscany, Bordeaux, and quite a few more). In general, vines were overly treated with new and powerful yet soil-insect-plant-unfriendly chemicals. The produced wines were often acidic and green with a lot of unripe tannins and bitter finish (which also explains why some of these wines from the 50s, 60s and 70s took more than 20 years to settle down and open up, if at all...). Remember as well, that the grape juice was pressed by foot in open wooden press (allowing all sort of things to happen) and that grapes were often fermented with parts of stem, leafs and dirt. In some of the big appellations, harvests were done with machines, with heavy used of chemicals to treat the vines against mildew, mold and other diseases, herbs and insects. Wineries and cellars were not always clean and brettanomyces occurred quite often. Corks were sometime a problem too. Wine needed a change. In the 70's, things gradually changed, and new generation of winegrowers and winemakers opened up on new and more adapted techniques, with better vineyard and cellar management. Studies of the various soil components and multiple experiences with grape varieties in vineyard and laboratory revealed the importance of the Terroir of origin, soil's types, microclimate and exposure of the vineyards. Bottling at the property also became a more common thing in the 70's. It reassured consumers regarding the quality of the wine and more especially its origin, and insure a better control of the production and distribution. 1976's Steven Spurrier Paris Wine blind-tasting of California wines versus French with both prominent Californian and French producers and judges tasting these wines, dispelled the myth of French Wine superiority and promoted the expansion of wine production in the new world. Steven Spurrier is one of the famous British wine authorities that changed our way to taste wine. He is also the founder of the Academie du Vin and Christie's Wine Course (the famous Auction company), in addition to authoring and co-authoring several wine books. Following this event, the 70's also marked the beginning of a cold war of difference of taste and palate between the old world (lighter, with more acidity and tannins) led by the British and the French and the new world (riper, fuller, bolder, woodier) led by the American. It is not until the 80's, that techniques and tastes really drastically changed, especially with the rising reputation of internationally renown wine critics, writers and importers (like Robert Parker Jr., Master of Wine Jancis Robinson, savvy wine writer and taster Hugh Johnson, and other wine connoisseurs like Clive Coates, Michael Broadbent, Kermit Lynch and many more, etc... plus, some magazines like Decanter, La Revue des Vins de France and Wine Spectator and more especially the importance of new importers and wine merchants digging for better producers). Also in the 80's, deeply influenced by the American market, trend and fashion (TV series, cloths, music, cinema, food, etc...), European wines in general started to take a different attitude and dimension. The notion of ripeness became much more important and a key selling point. Bottling was now an established quality factor and the use of heavy toasted new oak barrels became a standard. Bordeaux (and a few more European regions) was Californized. The trend of overripe, higher alcoholic content, more opulent and woodier wines spread around the world from Australia to South Africa to South America. Strangely enough, it was a trend but it was also partly due to climatic changes and rise of temperatures, because of the ever-expanding population and more especially the pollution and it's consequences (but this is another subject). We had to wait until the mid 90's to see the trend of taste changed and evolved for better wines from smaller producers from up-and-coming and fairly unknown regions around the planet. Winemaking also evolved and with the need of being more natural and the world, by now being a bit more aware of the consequences of our own behaviors and actions towards the environment, the trend went for Organic and Biodynamic and Lutte Raisonnée (or Sustainable Culture). Et Voila! That is roughly (and shortly) and in a more simplistic way, how we went from natural farming and agricultural process under the name of farming from our ancestors, to completely motorized and mechanical agriculture and viticulture with heavy use of chemicals and machine for more than 60 years, and suddenly in the mid 90's, admitting our mistakes after destroying the soils for decades, we went back to the old ways by recognizing that our ancestors were doing the right things and were much more environmentally oriented and aware than we will ever be. In fact, because it was our great and great-great grandfathers ways and methods, readapted with modern techniques and equipment, society decided to name farming differently, giving it a rebirth, and differentiating the style and methods. So now, beginning of the 21th century, suddenly everybody swears only by Organic (Biologique in French), Biodynamic and sustainable culture (or Lutte Raisonnée in French) types of method. Well, I'm sorry, but we didn't invent or discover anything new. We just took the knowledge and "savoir faire" of our ancestors and re-implemented it in our methods of today, simply because, only now, people are realizing the consequences of the last 60-70 years of untested experiences and the tragic result of the pollution. So we have to become green again and respect the environment in order to cure the ground and re-establish the natural living condition and ecosystem in the vineyards (and other crops) but also in our everyday life in general (recycling, using less water, less electricity, less gas, and so on...). At last, people finally understand that they have to open their ears and eyes to the world, and become more environments friendly. We are far from recovering soon and it will surely take some time and patience, before things will change and adopt a more concern and attentive attitude towards our planet. However, now the ball is somewhat rolling in the right direction. It is a good thing, and I hope that more and more people will do it and become greener and respectful of the environment. But let's get back to our subject: What are these names really mean (Organic -Biologique in French-, Biodynamic and sustainable culture - or Lutte Raisonnée in French -)? And what are they referring to? Well to put it simply, here is my theory about these methods. Organic culture (or farming or Biologique culture in French) means that only organic, naturally produced fertilizers, nutrients (like animal excrements, manures, composts mixed with dirt and other organic matters like herbs, hay, etc...) and non-chemical pest control can be used in the vineyards (or other crops). Herbs and natural ecosystem (like weeds, flowers, along with insects, etc..) in between the rows can be left untouched or partially managed by hand or machine by periodical aeration of the earth. It was somehow created to counter the rising of intensive industrial agriculture and viticulture after World War II. Although some people believe that the organic movement only exits since the mid 20th century and that it was created in response to the shift towards synthetic nitrogen fertilizers and pesticides in the early days of industrial agriculture, I do believe that it has always existed, we just gave a new name to it. But, it is basically how it has always been done, it is simply and pure natural farming, the way our great-great grand father used to do it. Acting with their feelings and guts and skills and knowledge on a seasonal basis, with estimated time zones during which they were doing specific things in the vineyard and in the cellar, also aware of the season, climate and nature changes. Paying attention to the moon, the tide, the rain and other natural phenomena's occurring through out the year. Modern organic culture remains the same as the old one, although it is now a bit more accurate and precise due to newer techniques, researches and technologies. Holistic development or "Holism (a Greek word meaning all, entire, total) is the idea that all the properties of a given system (material, physical, biological, chemical, social, economic, mental, etc.) can not be determined or explained by its component parts alone. Instead, the system as a whole determines in an important way how the parts behave"(text partly taken from Wikipedia). 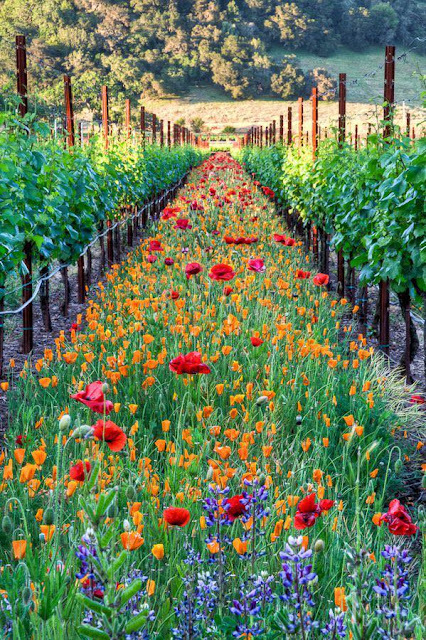 And Biodynamic culture is based on this concept that everything (and everyone) on earth, in our galaxy and in the entire universe, is related and indissociable. What I think, is that Rudolf Steiner, in the mid 1920's, wrote a book of previously gathered methods dating from the old ages, study them and apply them before turning his ideas, involuntarily but thanks to environment friendly green movement of the last 20 years, into the up-and-rising, successful concept and movement that it became in recent years. Way before his time, Greek, Egyptian and Roman (from what we discovered and learned over the years in the diverse extracted, excavated and reconstituted ruins and other sites in the countries around the Mediterranean sea) were looking at the stars, had extensive and advanced knowledge about Architecture, Art, Food, Agriculture and Viticulture and already established the relation and the indisputable interaction between the moon, the tide, the planet's movement and rotation, the season and the way all these factors affected the environment, the climate and the seasonal growing development of the crops and their entire ecosystem. Our elders already knew about Mother Nature's calendar even if not on paper. It was a part of their everyday habits and life as producers. I even remembered my grandfather, who was a local winemaker in the Cotes de Bourg, telling me about this kind of things when I was young. He wasn't following a book or a predetermine calendar. He was (and is still today) listening to Mother Nature, earth and her needs depending on the weather of the day and the season. And he knew, like many other men working the earth outside 364 days a year, what will be the forecast for the next few days, depending on the atmospheric pressure, the sky, the level of the water well, the behavior of his animals. Like him, most elders that I met knew the signs to look for and how to interpret them. They were in constant and perpetual understanding with their surroundings and their lands. They were looking at there life as a whole, reflecting on their everyday choices in order to take the right decisions, at the right moment, in their and nature best interest. Sustainable culture (or Lutte Raisonnée in French) is somehow a compromise between the two previous methods with more flexibility and the possibility to use some chemicals and pesticides but less often and less aggressively than conventional producers. Conscientiously practiced, this method resembles quite a lot to organic culture in many ways, except for the use, even if minimal, of chemicals. And compared to Organic culture or Biodynamic culture, the producers using the Lutte Raisonnée method (or concept) are not subject to any system of checks from certified organizations or any previously agreed limits to what is permissible to do in his vineyards. Therefore less restrictive, benefiting from more freedom and flexibility, Lutte Raisonnée results in taking the best of both concept and adapting it to the needs of your vineyards (or crops), depending on the type and fertility of the soil, the climate and micro-climate, the exposure, the topography and geography of the vineyards, but also the type of grape. You see, for example, and that is one of the reason why it is so difficult for a producer to certified Organic or Biodynamic: if your entire vineyard is fully Organic or Biodynamic but your immediate neighbor's vineyards isn't, you'll probably never be able to be certified. Moreover, if your neighbor uses pesticides and herbicides, you can't forget about it, because the wind may blow some chemicals in your vineyard and depending on the terrain, chemicals absorbed by the ground may drain or affected your soil too. More producers every year adopt the Lutte Raisonnée method first and experience it to measure the effects during a short period of time (2 or 3 years) and compare the resulting wines with previous vintage. If satisfy, they often opt for one or the other method between Organic and Biodynamic, but most don't want necessarily to be certified due to heavy administration, control and cost. I could continue on and on about this fascinating subject but I rather stop here for now. I hope this article about Biodynamic, Organic, Sustainable Culture and Lutte Raisonnée was helpful to make you understand a bit more the background, the origin and the concept behind these 4 concepts. Founded in 1956 by Mario Brunori, the winery is located near the village of San Paolo di Jesi, in the Contrada San Nicolò, perched at 200 meters above sea level. The village resides in the heart of the Verdicchio dei Castelli di Jesi Classico DOC, in the Le Marche (Marches) region, central eastern part of Italy. His son Giorgio came soon after to work alongside him. Today, the family estate is now led by Mario's grandchildren, Carlo and Cristina, who have inherited not only the extensive experience in tending the vines, but also a deep interest in the knowing and applying modern technology. The Brunori family, whose ancestral home is the town of Cupramontana (Province of Ancona), have always been producers of Verdicchio wine, but it was not until 1956 that they went from simply turning out wine in barrels to bottling their product, at the same time opening a sales outlet in the town of Jesi (Province of Ancona). Although their production remains 90% of whites made with Verdicchio, they now produce quite a few wines with other grapes (3 reds, 3 whites including their famous San Nicolò Verdicchio Classico Superiore), but also a sparkling wine (Verdicchio Vino Spumante Charmant process), completed by a small production of Olive oil and 3 different Eau de Vie. Their 2005 Brunori "Barco" Rosso Conero DOC (Marches), one of the 3 reds they produce, was fermented in stainless steel tanks with grapes skins and pulp for 7-8 days. Followed by a short ageing period in cement thank then transferred into oak barrels (1/3 new) for another 6 months. Made from 100% Montepulciano from a 6.5 hectares vineyard with dry-sandy mixed soil and southeastern exposure, located in the Rosso Conero DOC, on the slope of the Monte Conero, a mountain overlooking the city of Ancona. From a different source, this wine may contain 10% Sangiovese and spend a bit more time in oak, but the winery website doesn't mention it. In the glass, Brunori Barco's robe exposes an intense ruby red color with red onion shin reflects that will clearly mature to orange with age. The nose is earthy and floral, Violette and Rose notes, with aromas of ripe dark berries. The palate is dry, medium bodied, quite mellow yet with very good acidity and persisting dark, earthy fruit flavors. The finish is here again earthy, with slightly dry tannins. Overall, an interesting, sapid wine to pair (like most Italian wines) with food, to attenuate some of the tannins and soften the texture. Red meat, pasta dishes with red sauce and aged cheeses should complement it nicely. Step into the Green! Drink more Bio and Organic wines from sustainable culture and respect the environment! The Coste della Sesia DOC (roughly translated Slopes of the Sesia) is a relatively small, unknown DOC and hilly region, nestled alongside the up-and-rising Lessona DOC and near the more established Ghemme and Gattinara DOCG, in the foothills of the northeastern part of Piedmont facing Switzerland (west of Novara). The name comes from the river Sesia, a tributary of the Po, which finds its source in the glaciers of Monte Rosa at the Swiss-Italian border. Emerging slowly, this appellation received the DOC status in 1996, allowing a tiny group of producers to better craft and promote their wines. The DOC is mainly planted with Nebbiolo, also locally called Spanna, Vespolina and Croatina grape varieties and a touch of Barbera, producing great reds and rosés. The whites are mostly made with the Erbaluce grape variety (85% minimum + other local grapes). Paolo De Marchi, owner and manager of Isole e Olena, an estate acquired by the Di Marchi family in 1950, making wines like Cepparello in Chianti (Tuscany), has become one of Italy's most respected artisan winemakers and a force for positive changes in the Tuscan wine world. Although, Paolo found fame and recognition in Tuscany, his roots have always been in Piedmont, where he is from. The De Marchi family inherited "Proprietà Sperino", located in the Lessona DOC region, in the middle of the 19th century and produced wine there until 1970. In 2000 Paolo, along with his son Luca, began reclaiming 25 acres of hillside vineyards by replanting Nebbiolo and the other indigenous varieties, Vespolina and Croatina. Both now manage the estate producing white, rose and red wines. Depending of the vintage, Rosa del Rosa is a tank fermented Rosé made from about 65-70% Nebbiolo, and roughly 20% Vespolina and completed with Croatina. 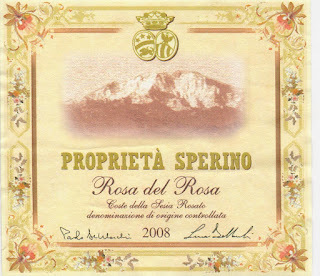 Surely because of the quality of the 2007 vintage in Piedmont, this 2007 Proprieta Sperino "Rosa del Rosa" Coste della Sesia Nebbiolo blend is a fine example of a great rosé from Piedmont. The robe exposes a superb and intriguing, clear, clear, bright, pale orange-salmon color. The nose is fresh, clean, mineral, fruity and floral at the same time with scent of wild red berry and rose petal. The palate is great with watermelon, cantaloupe and ripe peach flavors evolving into white, smooth juicy fruit with a vivid, pink grapefruit-like, citrus acidity in the mid-palate. The finish is fairly long, nice and dry. Overall, this wine is a tasty sipper with enhancing minerality and racy acidity. Somewhat different yet lovely and approachable. To discover this summer. In the year 2000 the seven Morini cousins decided to join forces and start vinifying the grapes from the vineyards that belonged to their fathers for more than 40 years. The name of the estate originates from the Latin name of their home town, Illasi: the Roman troops on their way to conquer the northern “barbaric” regions founded villages in the sheltered valleys of the Valpolicella and planted vines and olive trees. Latium released the first Amarone in 2007 a wine that embodies the style of the estate: fruit driven, lush and rich and yet retaining great elegance and drinkability. Made from 70% Corvina and Corvinone, 20% Rondinella,10% Croatina and Oseleta, this wine is an authentic example of a great, earthy and slightly rustic yet rich and fruity Valpolicella. Crafted in a (somewhat) Ripasso style, 40% of the grapes underwent a 30 days drying period before a short Crio-maceration (after de-stemming, the grapes are cold macerated on the skins for about 10 to 12 hours) followed by a 12 days fermentation in stainless steel tanks. The maturation occurred in Slavonian oak tonneaux (big barrels) for 15 months. 10,000 bottles were produced. The robe is quite dark ruby red. The nose expresses aromas of earthy, very ripe to almost sweet, dark and blue berry with (somewhat) animal and forest nuances. The palate is quite nice, easy, soft, rich and very fruity with a lovely texture and excellent mouth-feel. The finish add an extra dimension with a touch of earth, notes of scorched dirt and hints of spice. Overall, it was a pleasant surprise for a Wine Buyer like me who is not really a big fan of Veneto's reds like Valpolicella and Amarone. I've found it very good and pretty enjoyable for a wine at 14.5% of alcohol, even if I normally do not like to go over 13.5%. One needs to remain open minded with everything and especially with wines and food, because you may not like a certain type of wine (or dish) one day, but discover a very similar wine (or dish) crafted by another producer (or a chef) the next day and really enjoy it....and that goes for everything. History: Remains of a Roman winery have been found at the site of the Domaine Faillenc Sainte Marie, a testament to the ancient tradition of winegrowing at that location. The domaine, in its present form, was founded during the reign of Louis XIV by an officer returning from service on the Indian subcontinent. Situated just outside of the tiny village of Douzens a mere 12 kilometers east of the ancient walled city of Carcassonne, Faillenc Sainte Marie has recovered its past allure under the careful guidance of the energetic Gibert family and now produces an exciting range of red, white, and rose wines. Domaine: Faillenc Sainte Marie is a small property, with only eight hectares of vineyards stubbornly clinging to the rocky foothills of Mont Alaric. The vineyards are buffeted by the northernwesterly Tramontane wind or the southerly Autan breezes coming off the nearby Mediterranean, creating an extremely dry climate. Syrah, Grenache Noir, and Cinsault are the red grape varieties raised here. A small vineyard (1 hectare) is devoted to white grapes: Roussanne, Macabeu, Bourboulenc and Clairette. The terroir is composed of inhospitable, rocky limestone terraces. Only vines, olive trees and some scraggly brush survive under these harsh conditions. As a result, yields are naturally low. The grapes are strongly marked by their environment and this powerful character shows through in the wines. The charming, quirky personality, sense of humor and creativity of Dominique Gibert, as well as the sensitive and diligent vineyard work of his wife, Marie-Therese Gibert, also mark these wines, both in their style and in their names and labels. The rosé is made with the saignée method. The grapes, in this case 100% Syrah, go into a tank for a short period of time, usually overnight. After this short maceration period, the juice "bled" off has absorbed some color from the skins, but is not dark. The fermentation is long and slow at controlled temperatures. The Giberts like to leave a trace of residual sugar in this rosé, believing that it complements the fruit. The temperature in the fermentation tank is reduced to just above the freezing point to kill the yeast and stop the fermentation at around 13% alcohol and 8 g/l residual sugar. The inspired name: "Rosé des Glacières". The Corbières Rouge is made from a blend of Syrah, Grenache and Cinsault. The harvest is partially destemmed before going into the fermentation tanks. The different cépages are fermented together, benefiting from the long maceration period to extract the maximum of flavors and allow them to harmonize before being pressed and aged. This is a wine with enormous character. A special cuvee of Corbières Rouge, the "Syrhconférence de Presse", is a unique and profound wine. Its name is derived from a play on words that refers to its origin as a "press wine" exclusively from Syrah. Contrary to the traditional Corbières mentioned above, this wine is aged in small oak barrels (not new). 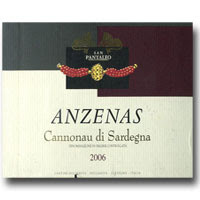 The resulting wine is powerful and velvety at the same time. The white cuvée "Pas des Louves" (female wolf steps) is made from a blend of Roussanne, Macabeu, Bourboulenc and Clairette. The different grape varieties are pressed and vinified together benefiting from fine lees contact during fermentation which gives the wine extra body and complexity.